The Oasis; a futuristic land where anything can happen, only problem is that it’s not real. It’s a virtual reality world where most people from the year 2045 spend a considerable amount of their time to avoid the problems of everyday life. Its creator was James Halliday, a mysterious genius who was also a bit of a nerd. When he died, he offered to give the Oasis to anyone that could solve a series of riddles and win three keys. Our hero Wade Watts is determined to win the prize. 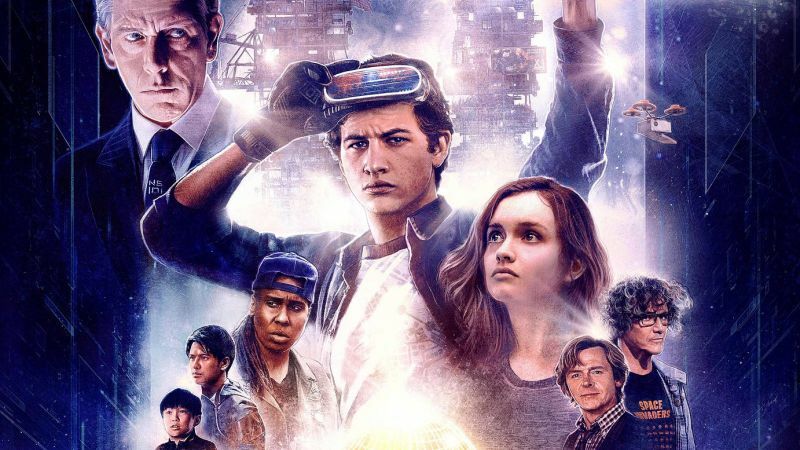 This film is based on the 2011 novel by Ernest Cline. The book was a huge success at the time and was optioned for a movie adaptation before its release. The only problem with it is that the character of James Halliday is obsessed with 80s film, and therefore cars, bikes, clothes and other items from these films feature throughout! There are small nods to almost all the cult films from that decade, which is fine for a novel but a little more expensive to produce on screen, where copyright issues are something of a minefield. I’d imagine there were a few man hours at Warner’s legal department spent on this film! The director willing to take on this battle was one S. Spielberg, no mere novice in the field and the man responsible for many of the best kid’s films from that decade (although they are largely absent from this film). Spielberg has been focusing on films for grown ups for the last number of years but did work on the BFG (2016) and the Adventures of Tin Tin (2011). Make no mistake, this is not the film Spielberg will be remembered for! The book is often described as mix of Willy Wonka and the Matrix, and it does draw heavily on both. The film is an enjoyable romp with some good ideas and interesting visuals. There are also some scenes that will leave you counting the tiles on the roof of the cinema! The romance/ love scenes are dull and you never really care what happens to the minor characters, as they’re impressively underwritten. In truth, they could have been dropped entirely from the film and it wouldn’t have altered much of the overall flow. Despite all this, it really is Spielberg doing what he does best, telling a great big story with lots of interesting ideas and a pinch of fairy dust. Spielberg may never better what he did in the 80s, but he’s still putting smiles on faces and bums on seats!